Before you begin shopping for a house, you should find out the maximum amount you can afford to pay. 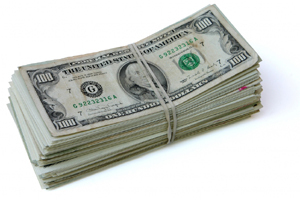 This is usually the sum of two amounts: the cash you can offer as a down payment and amount you can borrow. The first step is to shop for a good lender. (Click here for some excellent tips from Jack Guttentag, the Mortgage Professor, on how to do this.) Guttentag gives top scores to online lenders Amerisave and E-Loan for "depth and comprehensiveness of the information provided," so you may want to start with them. 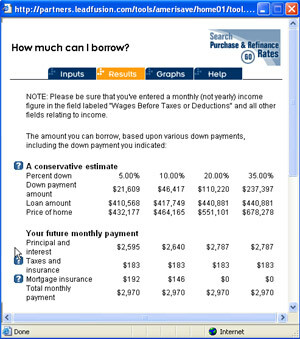 At either of these sites, click "Calculators" on the toolbar, then on "How Much Can I Borrow?" (for Amerisave) or the "Home Affordability Calculator" (for E-Loan) to get a rough idea of what you can borrow. In order to approve a mortgage loan, of course, a lender would need more information about your finances and an appraisal of the property you plan to buy. Many lender websites have calculators that give you a rough estimate of how much you can borrow. You'll probably be pleasantly surprised at the amount of money you'll be able to borrow--loan officers can stretch you to the limit (and beyond) of your ability to pay with creative devices like adjustable rate mortgages (ARMs), graduated mortgages, and interest-only loans. But before you start house hunting, you should think carefully about how much you should borrow. Here's a good resource for thinking this through. Be aware that mortgage loans over $417,000 are called jumbos or conforming jumbos (sometimes called confumbos) and carry higher interest rates than those under $417,000, which are called conforming or conventional loans. If possible, try to keep your borrowing below that threshold. Your credit report gives the lending industry's assessment of how good a credit risk you are. Since this is one of the factors that a lender considers before approving a loan, you'll want your score to be as high as possible. It's a good idea to check your score early on, so you'll have time to improve it by fixing errors or making changes in your finances. This CNN Money article offers suggestions on how to improve your score. When considering offers, sellers don't just look at price. They also care about whether the deal is likely to make it through escrow. Sellers hate it when deals fall through. A relatively painless way to sweeten your offer is to append a pre-approval letter or certificate to it. The letter says that the bank has reviewed your financial information and that it's willing to lend you enough money to buy the house at the price you've offered, assuming other conditions are met. It won't show the maximum amount you can borrow, though, since that would tip your hand to the sellers. Getting pre-approved takes just a day or so, and involves filling out an application and submitting documents like paycheck stubs and bank statements. You shouldn't have to pay a fee. Applying for a loan is no longer an ordeal, since lenders have access to an alarming amount of information about you. People will often spend more time shopping for shoes than they will a loan. But shopping for a slightly lower interest rate can save you lots of money over time.